"For The True Boxing Enthusiasts"
Robert Guerrero (31-1-1, 18 KOs), has been shunned from being anointed one of the sport’s better fighters for a couple of years now. No longer has he, nor will he from now on, have such a burden after Saturday night’s showdown with the world’s number one pound for pound fighter, Floyd Mayweather (43-0, 26 KOs). Guerrero will depart from the ring with more eyes on him than have ever been the case for the 30-year-old, former multiple division world champion. The welterweight crown however will not be following him back to California. The championship at 147 pounds’ destiny will instead be but a few miles away from the MGM Grand Garden Arena, Mayweather’s home; Following what may very well be the highest grossing fight of the year. Guerrero has fought his way through the featherweight division all the way up to welterweight to become Mayweather’s mandatory title defense. Unlike some mandatory challengers in boxing, Guerrero is without question deserving of the golden opportunity put forth in front of him. Guerrero has never lost in a championship bout and held world titles at featherweight, super featherweight, and lightweight. That may ring as a red flag for some unfamiliar with Guerrero, that he fought some of his prime years as a featherweight. Mayweather too, however, fought some of his best years at the super featherweight division. 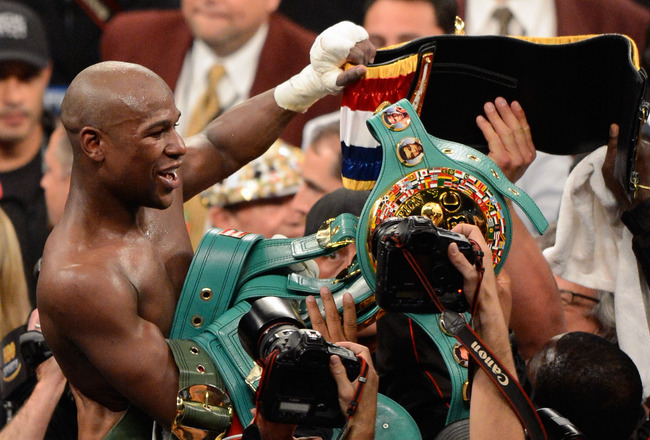 In fact, Mayweather complied the most title defenses of his career in the 130 pound division. So worries of a size disadvantage for both the Mayweather and Guerrero fractions should be put to bed. Along with the notion that Mayweather is taking a soft touch. Due to Mayweather’s 2009 virtuoso showing against Mexican legend, Juan Manuel Marquez, Guerrero is now the man standing as the universally recognized top contender in the welterweight . Guerrero is hailed by many experts (including The Ring magazine) to be good enough to warrant this fight not just being a WBC world title fight. This bout has raised the stakes and will now crown a lineal, and thus undisputed, welterweight champion of the world. Mayweather has not held the lineal championship since December of 2007, when he knocked out Ricky Hatton to defend the championship before a two-year retirement. Robert Guerrero may be called “The Ghost” but it is Floyd Mayweather who is typically the phantom inside of the squared circle. The intensity and aggression of a raging bull is what is to being expected out of Guerrero and it is most definitely what he will need. Guerrero in his previous bout bullied around a supposed larger, more athletic fighter in former world champion, Andre Berto. That bout, which took place last November, is what made the boxing world believers of Guerrero’s package at the welterweight division. Guerrero was the supposed smaller, not as strong, and lighter punching fighter coming into that fight. That was supposed to be the script. Instead, it was Berto who tasted the canvas twice and got bullied from corner to corner all night long as Guerrero out worked Berto through twelve decisive rounds for a unanimous decision. Mayweather, like Berto, is the supposed more athletic and skilled fighter. The difference is though: Mayweather is more athletic and skilled than Robert Guerrero. Guerrero will find himself in no mans land, like Tom Hanks in Cast Away, if he is to allow the fight to be fought from the outside. His best, and only chance, is to incorporate the same game plan that was successful against Berto and to be nearly as fresh in the final minute of the final round as he was in the first minute of the first round. As Floyd Mayweather always is. Guerrero did not just sign up for the biggest fight of his career just to cash in on a big payday. He is without question showing up with the heart of an underdog ready to triumph with the odds against him. When the opening bell rings, that will be apparent to all who will be viewing. Guerrero’s intensity and volume of punches will see to it early on that Floyd Mayweather will have some problems on his hands. After four, or maybe five rounds, expect an even fight. What will ensue once the second half comes around will be the showcase of one Mayweather’s most shining attributes: his ring IQ and ability to make adjustments. Mayweather will have the versatility to switch up whatever he is doing to implement what can be most effective against Guerrero. The right hand down the middle should find Mayweather a lot of success as Guerrero comes in with his southpaw stance. Floyd Mayweather still leaves fans and critics alike awestruck by his defensive wizardry. In his past few fights though, Mayweather has been more planted and sturdy in his stance than ever before, and it looks as if it has given his punching power a boost in this weight division. Not only has his power possibly gotten a bit better, but it is the physical strength of Mayweather that has without question increased. Mayweather is now a much more natural welterweight than he was when he first ventured into the weight class over 7 years ago. That strength Mayweather has accumulated at the age of 36 will pay dividends, as Guerrero will find it harder than he may expect to do the rough housing tactics he is effective with. After a good first half of a fight, Floyd Mayweather will take over the fight. He will begin picking off Guerrero as Guerrero comes inside, and the number of punches landing for Mayweather per round will increase gradually as the fight continues. This fight has the makings of a more competitive version of Hatton-Mayweather. With Guerrero being Hatton, and scoring early on with some success getting rough on the inside. Mayweather though, being the underrated inside fighter he is, will be dishing out good punishment himself. Particularly to the body, and when the inevitable separation comes between the two fighters and there is distance, Mayweather will have dominant moments. Guerrero will not quit. He may taste the canvas, but he will not take a 10 count. Either Guerrero’s corner, the Nevada State Athletic Comission, or the referee on hand will see to it that Robert Guerrero will not endure a full 12 rounds in his attempt to dethrone Floyd Mayweather. BRB’s FINAL PREDICTION: FLOYD MAYWEATHER VIA LATE ROUND STOPPAGE. Big things in store for Porter/Brook winner. Brandon Rios looking to come back strong. Golovkin flattens Geale in 3, takes step towards stardom. “GGG” looks to continue his dominance against Daniel Geale. Be up to date on Bleacher Report Boxing's latest content via email.